Rebelle 2 integrates groundbreaking improvements, watercolor and acrylic brushes got an unprecedented realistic look and together with watercolor masking fluid give an exceptional traditional feel to the digital painting. Completely new brush engine allows users to create custom brushes - round, flat, bamboo, various wet splatters, sponges and many others. Moreover, Rebelle’s various wet tools - watercolors, acrylics or ink pen can be combined with pastels, pencils or any other dry media tools, in wonderfully intuitive ways. New stencils and selection tools together with wet paint diffusion open new creative results yet not possible to achieve in digital art. This new super charged version comes with full multi-touch support and layered PSD support. All these convenient features are wrapped in an agreeable and easy to use interface with a tiny learning curve. 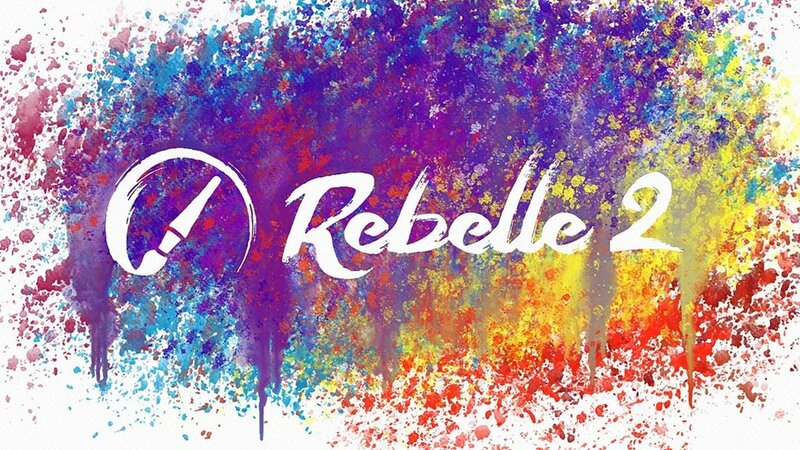 Rebelle is an award-winning watercolor and acrylic painting program created by Escape Motions. Its watercolor simulation is based on a real-world color mixing, blending, wet-diffusion, and drying. Rebelle convincingly mimics the way natural media interacts with the canvas and itself. Users can paint, smear, re-wet dried colors, blow wet washes across the paper, tilt the paper to create water drops and runs and create countless fantastic watercolor effects. In the first Rebelle version our main focus was to create the most natural watercolors in the world of digital art. It is a real challenge to simulate watercolor behavior in a digital form, because it has many nuances and subtle details which makes it so specific. Very important in the creative process is the paper structure which in combination with brush grain and water behavior creates many beautiful variations. In the second Rebelle version we made watercolors even more creative, but also focused on other tools, especially acrylics which got an extraordinary realistic look. New Rebelle 2 version is available for Windows and Mac OS for $89.99 from April 25th 2017 on Escape Motions website. It comes with unconditional 30-day money-back guarantee as well as 50 % discount for existing Rebelle users. Minimum: Intel i5 or equivalent AMD processor, 4GB RAM, 100MB hard disk space, Open GL graphics card with 1GB RAM, Windows Vista (64-bit or 32-bit) or Mac OS X 10.8. Recommended: Intel i7 or equivalent AMD processor, 16GB RAM, 100MB hard disk space, Open GL graphics card with 4GB RAM, 64-bit system Windows 7, 8, 10 or Mac OS X 10.9 and newer, Wacom or Surface compatible tablet. New brush engine - Newly implemented brush engine allows users to create unlimited brush variations. Users are able to create their own custom brushes or enjoy by default implemented shapes - round, flat, bamboo, various splatters, sponges and many others. With option to use GPU acceleration, brushes can have bigger size and faster response. Creative stencils and masking fluid - Stencils in combination with watercolor diffusion opens new possibilities for budding artists. Users can mask out painting areas, wet the paper and let the watercolor simulation create its magic. Selection tools - Create quick masks and define shapes that block off the areas you do not wish to change. Classic freehand, polygonal, elliptical and rectangular selections got a new meaning when used in combination with traditional wet media. Layered PSD support - An implemented layered PSD import & export is compatible with Adobe Photoshop and enables to transfer works smoothly also into other 3rd party graphic applications. Faster performance - Undo/redo and new file management are highly optimized so the whole painting process including opening and saving big artworks is much more fluent. Multi-touch experience - Rebelle has a complete support for multitouch gestures for Wacom, Microsoft, Apple and alternative tablet and trackpad devices including Astropad application. User Interface - Interface is intuitive and easy to use, ideal for beginners or traditional professionals which may find that creative process can be very fluent also in a digital art. Simplicity and every important feature in reach is the first thing you find when using Rebelle. Escape Motions is a small studio of creatives and coders dedicated to develop innovative visual tools. We love to experiment with interactive art, new media and code to find a new expression and bring new experience for artists and designers who want to stand out from the crowd. This is why our Flame Painter, Amberlight and Rebelle were born. How did it all begin? What’s the story behind Escape Motions? Peter Blaškovič, a young designer from Slovak Republic, developed in 2009 a painting application within his "I am an artist" experimental project, which became one of the top procedural painting applications in the world. He called it Flame Painter, and its unique particle brushes allow the artist to create original artworks, light effects or unconventional designs. The third version Flame Painter 3 offers many advanced features for CG artists and professionals, whereas Flame Painter for iOS with its intuitive and playful user interface is specially designed for children and enthusiast artists. An equally unique and innovative Amberlight 2 is perfect tool for all digital artists who love to experiment with beautiful computer generated fractal-like images and animations. After launching the first version of Rebelle in May 2015, we kept on working on new features for two years to deliver the closest a digital tool has ever come to the flow, spontaneity, and feel of traditional materials - Rebelle 2. After implementing many unique ideas and users' suggested features, Rebelle 2 is now ready to bring an unsurpassed experience to digital painting world. With its unparalleled organic feel, this new-era painting tool is a must-have for every artist’s digital toolbox. Peter believes that everyone can be an artist and his vision is to inspire people to be creative. "Many people think they cannot draw or paint at all. Therefore I want to keep creating tools that encourage and liberate people to express themselves." he says.